Sio Bibble led his group of Ithorian helpers that included Esoom and R2-CM to a huge round and open outdoor commons area. It was enclosed by buildings on all sides with a large walkway going threw the middle that led to Queen's throne. The area also had many trees, fountains, people and birds of all kinds. There was a river of water that wrapped around in a circle half way in the center of the area. The Ithorians thinking that they had a long walk to the castle continued to stroll on. Suddenly a strong female voice came at them from the right. "Greetings my Ithorian brothers to Naboo" someone said. The group looked towards where the voice was coming from but only saw a tall bush that looked out of season standing next to a small round waterfall. Sio raised his hand palm up and pointed at the skinny plant and said. "It is my great pleasure to introduce you to the ruler of the Naboo! Queen Amidala!" As they looked on the plant turned around to reveal a white and fair humanoid face with red lips and a red dot on each cheek. It was not a real plant at all but a beautiful gown made out of fallen leaves from the native trees of Naboo worn by an even more beautiful young woman. No wonder it looked like a plant from the back that was out of season in these warm summer months with its brilliant red and gold colored leaves. The group leader of the Ithorians advanced slightly and bowed in respect, soon the others followed. "It is I who should be bowing to you." the queen said with much respect, "If you would not have come to help us, many rare plants and animals would face certain extinction due to the carelessness of the Trade Federation." Everyone then got in a line and slowly introduced themselves, Esoom was at the back of the line and a little nervous because he had rarely ever left Ithor except for on a herd ship. "And you must be Esoom!" the queen said when it was finally his turn, "Your Elder spoke very highly of you and the advancements you made on your little friend here." "Thank you Queen Amidala, it is a pleasure to help you." Esoom said happily. "I will be sending my handmaiden Padme with your group and my personal astromech and friend R2-D2. They will report back to me and let me know how well the progress goes. They will be meeting you at the cleanup site tomorrow." "Thank you again your honor." Esoom said again and he and R2-CM bowed one more time. Steeping back to address the whole group the queen belted out loud. "Thank you again my brothers, let me know if there is anything I or my fellow Naboo can do to help! I am sorry I can not stay and chat but I have many other things that need my attention before the sun sets." The queen turned and headed down the center path towards the castle. As she walked hidden security personnel popped out from behind the trees and followed behind her. Sio Bibble then addressed the group. " Come! let me show you to your rooms, you must want to rest and eat after such a long trip. We will start fresh and early in the morning." The group then followed Sio to settle in for the night. Later in the evening before the sun was ready to set, Esoom strolled outside his room where his astromech friend was starring at the scenery threw a marble railing. The two of them stood there quietly and watched as the Sun started to set. After a while the little droid let out a small sigh. "Yes R2-CM I have seen many sunsets in my time too, but never one like this. "Esoom said as he realised he no longer felt like a stranger to this new land. The next day, Esoom Mendo and R2-CM had all the gear and supplies they needed ready and waiting next to the rest of the Ithorian volunteers stuff on one of the many landing pads. In the distance everyone could see a ship approaching. It was a reddish Corellian Star Shuttle, far nicer a ship than they were expecting. After the ship landed on the platform everyone put all their gear and supplies aboard the vessel. The trip was pleasant and uneventful on the way to Naboo. CM plugged himself into one of the ships recharging sockets and powered down for most of the trip so he did not have to worry about the deep space flight. 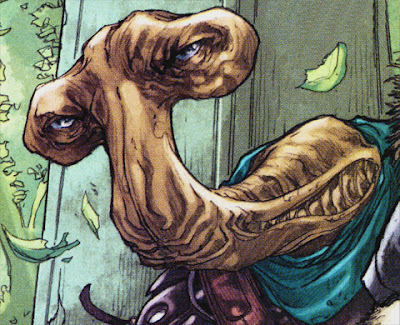 all the while Esoom discussed with the other Ithorians what plan of actions would best help out the Naboo and the Gungans. When they reached the Naboo star system and dropped out of Hyperspace, Esoom woke up the droid and asked him to follow him to the bridge. CM was not to happy about the idea but followed anyway. From one of the tall thin windows they could see Naboo in the distance. It was a big blue/green ball hanging in space, and it grew bigger as they approached. When they got closer they past the remnants of a Trade Federation Droid control ship, it was torn in two and the center sphere was completely annihilated. 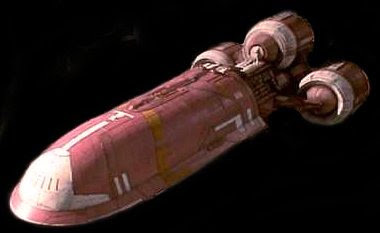 There were many ships from different systems collecting debree and dismantling the ship from salvaging rights they have obtained from the Queen and the Gungan leader Boss Nass. 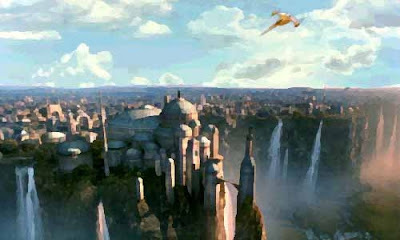 As they descended threw the atmosphere they could see the city of Theed come into view. The city was huge and most of the bigger buildings had dome shaped tops. Small rivers and creeks ran threw the city and ended in spectacular waterfalls. Two yellow and chrome Naboo starfighters escorted them to a covered hanger near the palace. Once they had landed and disembarked the ship the Ithorians were greeted by Sio Bibble the Queen's governor and a Gungan known as Roos Tarpals. "Welcome my Ithorian friends to Naboo and the city of Theed!" 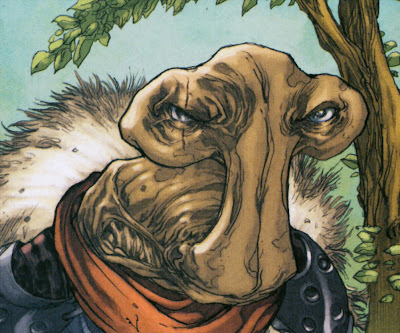 Sio said in a strong yet regal voice " For those of you who will be working with the Gungans please let me introduce you to Roos Tarpals. He will be taking you to see Boss Rugor Nass. 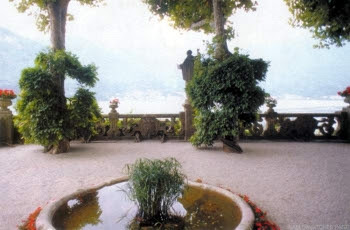 Those of you who are here to work with the Naboo please follow me, your belonging will be brought to your rooms later." The Ithorians split into two groups and went on their separate ways. As soon as the first rays of sunlight came threw the window the next day, Esoom came into the room where the little brown and white droid was watching his first sunrise. The droid spun around and let out a gently sigh. "Yes the sunrise is very beautiful." Esoom said, "I have seen many sunrises and sun sets in my time. So my little friend do you still want to take on this task?" The R2 unit spun around and approached the Ithorian then looked up at him. Without so much as a beep the little astromech slowly extended one of his brown utility arms towards Esoom and shook his body in a yes motion. Esoom grabbed the utility arm and shook it with both hands. "Thank you R2...uh....what is your number by the way?" " Well R2-CM, it is nice to meet you. Welcome to your new home, there is no need for you to stay in that storage area ever again except to keep an eye on the plants in there from time to time if you like. Come with me, we have much to do." Over the next few weeks the Ithorian and the little droid did many things together. Instead of just having the droid plug into a data socket to learn everything about the plants on the ship they would go on field trips on Esoom's off time. Esoom told the droid that to learn first hand about something will give him a greater understanding than any binary data ever could. Also Esoom upgraded many of R2-CM's systems. He did away with his leg booster rockets and put in a custom more Eco friendly repulser lift system. The Droid my not fly as fast but he would hover with much more control and flight time. He also upgraded the fire extinguisher to emit a higher volume of spray. The droid was also fitted with many other removable gadgets that could be swap out for other ones if the need would arise. After a few more weeks the same Elder came back for a visit to see Esoom's progress.The Ithorian proudly showed off all the new features and benefits that the Astromech could now offer. He also showed off the R2's vast knowledge of every part of the herd ship and all the plants within. After Esoom was done the Elder did not smile and walked to a chair and sat down. "Is there something wrong Elder? Are you not please with what we have done? "Esoom said worriedly.
" No I am very pleased with what you have done, but I have some important news for you." The Elder said,"The planet of Naboo was attacked by the Trade Federation a few days ago. The Naboo and a native species called the Gungans were able to drive them away, but unfortunately a lot of damage was done to the planets surface during the invasion and the ensuing battle. 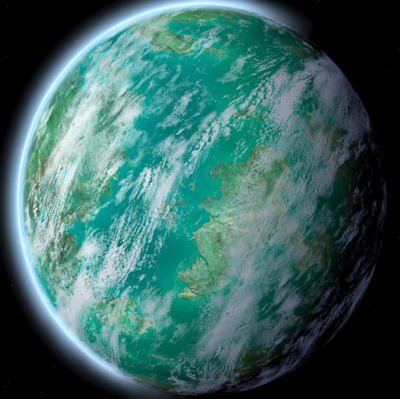 The Qween of Naboo herself has asked for our help in restoring the planets ecology back to its natural state. 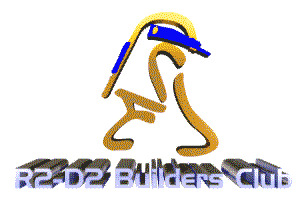 I have been viewing your project from afar from the start Esoom, and I am greatly pleased. That is why I come to you now I believe that it is time you took your friend R2-CM here on a field test to Naboo with the rest of the group I am sending tomorrow." Esoom and CM looked at each other and nodded. Then Esoom looked at the Elder and said they were ready. "I also heard the Queen is especially fond of astromechs herself, she looks forward to seeing yours in action. A Republic transport will be here in the morning to take you to Naboo, Good luck and may Mother jungle guide you." "Thank you Elder for this wonderful opportunity. We will not let you down" Esoom said delightedly as the Elder got up and walked out of the room. "Flying!" the little droid said loudly. "Don't worry, no part of you will be hanging out of a ship on this trip. Come, we have much to do before the ship gets here!" The two of them rushed off happily to begin a new adventure together. 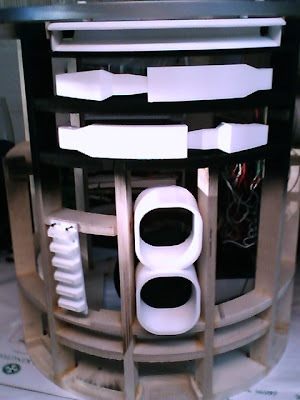 More resin parts and some chiseling! Well I was surprised to find some more resin parts in my mailbox tonight. I was not expecting them till Monday at the earliest. 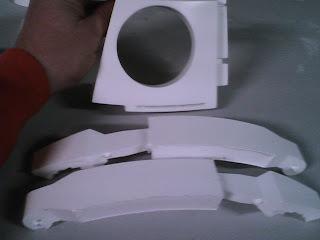 It is amazing how big these parts look when they are not all put together. Even the Holo eyes dwarf my Star Wars Miniatures Rancor! I could not help taking a picture of my new parts sitting in the frame. I know it will be a while till any skins are here anyway. I also did a little chiseling on my r2's armpit area. 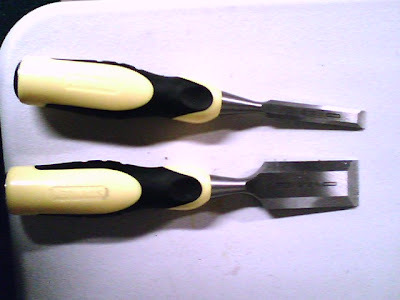 It is a good idea to always use a sharp flat chisel. Here is a picture of the Stanley ones I use. After seeing how fuzzy these camera phone pictures are I think I might get a real camera soon. 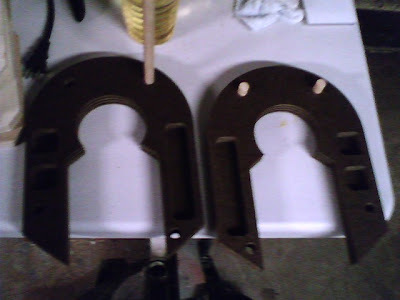 Well while I was getting parts for a job at Menards I picked up a piece of heavy duty angle iron to mount the center foot to. When I got home I went to my Barn to grab my cut off wheel. 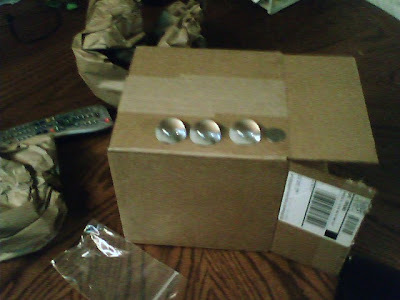 My dome motor came in but I did not realize that the quantity said two when I ordered. DOH! Well I will keep it as a spare or for my second R2 if I ever get around to it. I also got a couple other odds and ends like wire connectors and toggle switch covers. 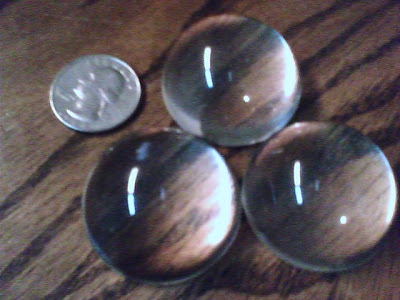 My Acrylic Cabochons from TAP Plastics came in today for my future Holo eyes! 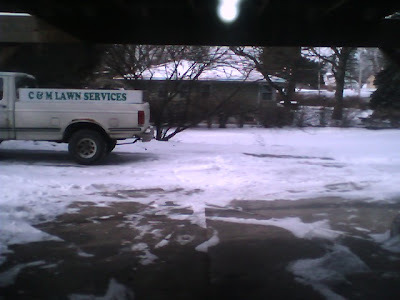 Well the weather warmed up this moring and is was a hot negative 13 this morning! So much for sanding again today.... but at least I have my marbles! Well other than finding that robot book today, nothing happened. To cold to sand outside and no new parts came in the mail. Considering I did not start my R2 build until January 1st 2008, I think I have got a lot done. I wonder when this run of 300Domes will ship? I can't wait to get mine! Also I am wondering when the next run of aluminum skins is going to start. My goal is to have him 80% done by the end of the year. 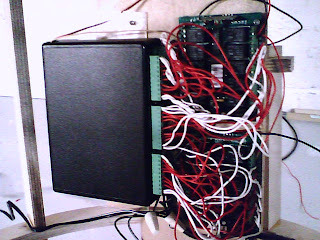 I still need to pick out a control system. I plan on my R2 a.k.a. "Patches" to do a lot of things. Other than moving around he will have about 8 mini micro controls that will open and do stuff. So if anyone has some ideas let me know! Well I don't think I will be taking my legs outside for some sanding today. 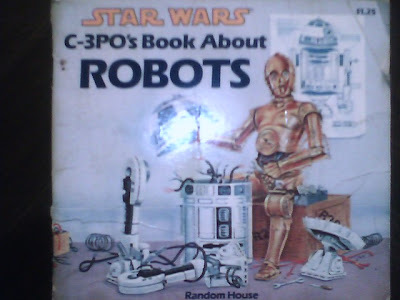 So I decided to do some cleaning instead, and by a strange coincidence I found my old book from the early 80s that got me hooked on wanting to build an R2 in the first place. 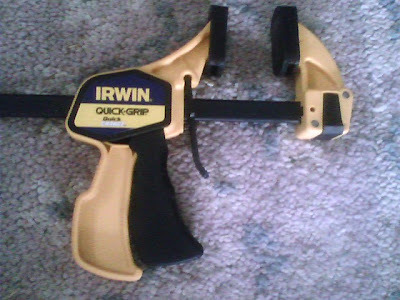 I got a new tool today! 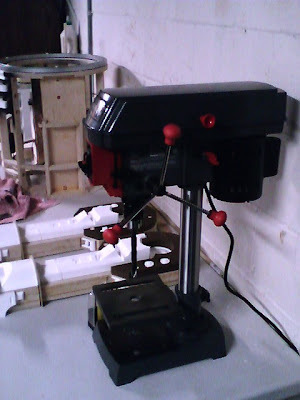 A drill press! This will come in handy when drilling pinning holes in the resin parts and the legs. 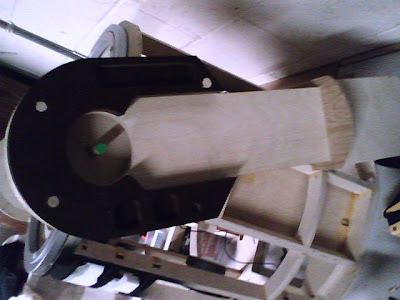 I will also be using it for drilling holes in angle iron to hold the middle leg up. When i think about it I could use it for work.......nahhhhhhhhhh! Here are some images of other famous Ithorians that i like. I like Ithorians because they remind me of Tibetan Monks in there pacifist nature. I am going to wait to mount these because I am waiting to get all my R2/celebration dvds. Just incase there are some other tips and reference photos on them that I do not know about. Also when I see the DVDs I will start on the gas pipe for the legs. 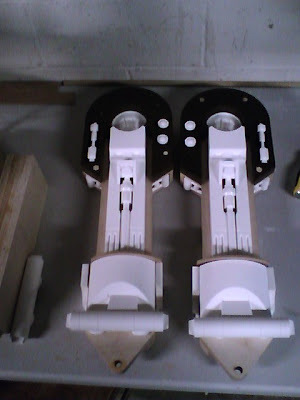 I also ordered the rest of the leg parts today, the pittman motor, pully. 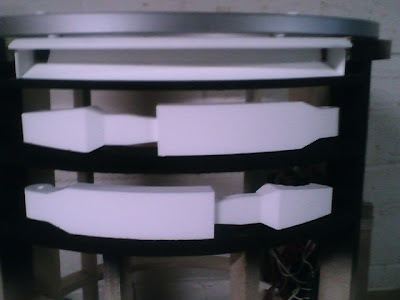 and mounting hardware. Legs are 95% done for glue up. 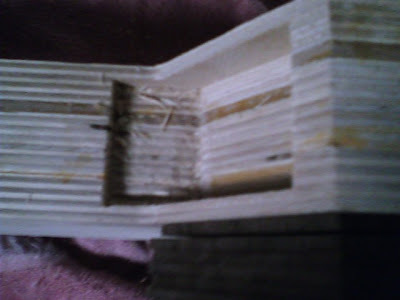 I am deciding if I want the sholders glued on perminatly or screwed on from the back. Getting the sholders on the right leg. My friend Jon came over and helped glue up the shoulders and I got the rest. 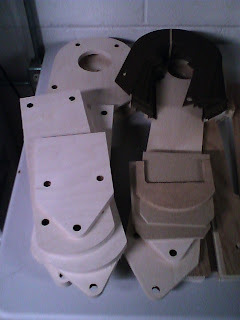 For the shoulders I used a slower drying glue called Waterproof Titebond III Ultimate Wood glue. It has a strong hold on smooth surfaces and the long drying time lets you have more time to clean out any glue that gets into the grooves. 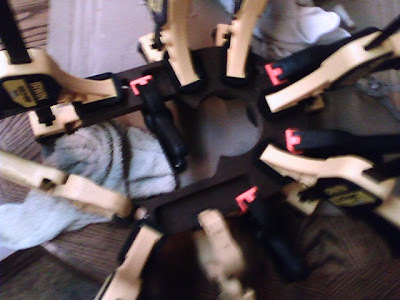 I also bought some high dollar clamps because the cheap bargain ones kept coming loose. The new ones are pictured below, I got 6 of them at $15 a pop. It may sound like a lot but its better that having to start over because a clamp let loose. I also got my CF3 sound system in with two 12 button remotes . It may look like a mess but thats ok for now until I get all the other electronics installed, then I will clean it all up. I also hooked it up to have remote volume control. The #12 button on one remote is volume up, and the #12 on the other remote is volume down. 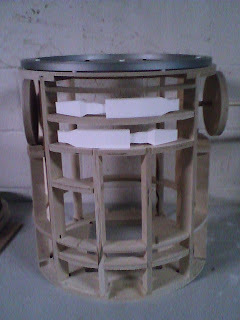 Well I got the frame put together and part of the legs. The glue for the frame and legs is a fast set glue called Elmer's probond interior/exterior weatherproof wood glue. I also got another project done today. My Star Wars Miniatures AT-AT that now lights up and makes a few sounds. I got my wood frame and legs today! Now I can start putting some stuff together! I also got my lazy sussan bearing in! 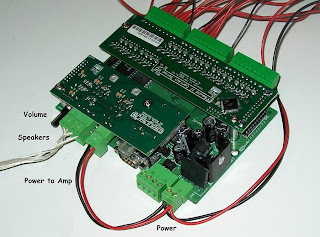 Below is a picture of a compact flash player mark 2. I got the new mark 3 that looks just like it. 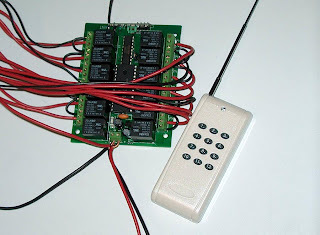 Below is a 12 button remote activator for the sound system. I bought 2 of them off ebay for $20.00 each plus shipping. The will activate the sounds in any order I want, they will also help me control the volume remotely. 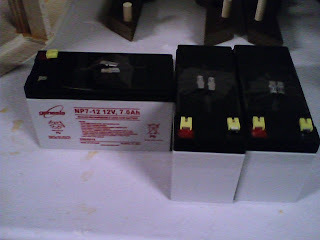 I got my three 12 volt 7 amp batteries for all the electronics and motors. I got them off Rage Batteries on the web. Cheap but very slow on delivery. 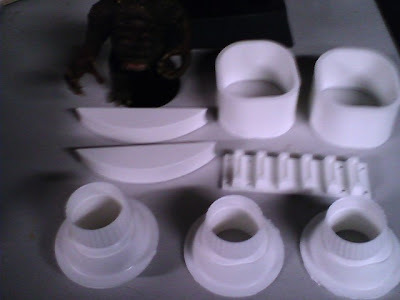 Just some of the resin parts I got today. 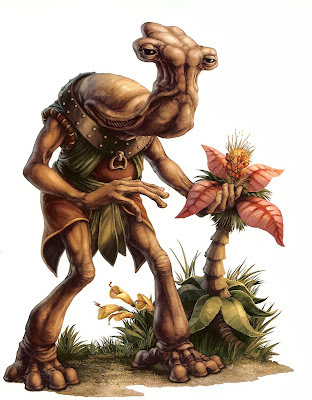 Esoom Mendo was like any other Ithorian working on a Herd ship, tending to the needs of the plants here and on the planet below. Unlike other Ithorians he also had a passion for droids and all they could do to help in his peoples daily activities. One day he asked one of his elders if he could try to modifiy an astromech droid from being a ships mechanic and navigator to being an asistant to him in his care of plants. The elder thought about Esoom's reqwest wondering why he wanted a personal droid for himself when there were plenty to help him when ever he needed it. The elder finally said yes knowing full well how well Esoom has done his job in the past. "Go to the droid storage area and pick out one that is not being used." The elder said slowly and carefully, "I know you like droids Esoom but if I find that you want a droid to be as a friend and not get your responsibilities done I will have to take it away. "Esoom was so happy, he jumped up in the air and almost started to hug the elder but stopped himself at the last second. 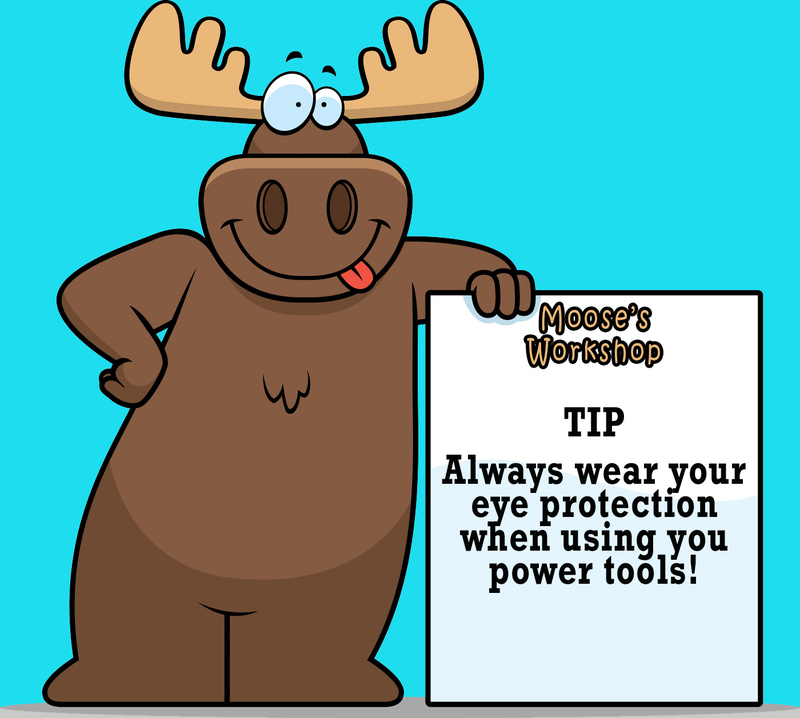 The Elder added, "get your work done first Esoom, then on your own time you can go." Then the elder went on his way to tend to other more important buissness. Esoom's excitement was building as the day went on, as he was tending to patches of flowers he wondered what model of astromech he might use, he has always liked the reliable R2 units and was hoping one might be there. As soon as his work was done he carefully put away his tools and said goodbye to his fellow workers. He casually walked out the door and down one of the many hallways of the herd ship, he rounded the corner and slowly increased his pace towards the storage area when he saw no one was looking. When he came to the room he opened the door and stepped inside, he looked around the dimly lit room and saw plants from Ithor and many other planets that thrived in low light conditions, the sound of running water could be heard behind the plants. In one corner of the room he saw three astromechs spring to life and start chirping different things to him and one another. One was an R5 with a purple paneled head and a greenpaneled body, another was an R3 that was all white except for his clear dome, and the third was an R2 with orange and white color scheme. Esoom approached the droids and introduced himself, most other species would probably just grab the nearest one and go but he wanted to make sure the droid he picked would be interested in his offerbecause he did not believe in memories wipes. He explained what he wanted to do but the astromechs just laughed. With Esoom's love of droids he has learned to understand droid speak, then the R5 beeped out harshly, "we are not built to be gardeners! Go away unless you have a ship for us to fix!" Esoom was very disappointed and started to head for the door. All of the sudden he heard the water stop and then the slow whimpering cry of an R2 unit. Esoom spun around and peered threw the plants and saw the faint glow of red then blue, he walked around the plants to a narrow area between the plants and the wall and saw another R2 unit with a wall hose in one of his grippers. "What are you doing back here?" Esoom said questionably. In a very sad voice the R2 unit said "watering this plant, its moistuer content needs to be at 65%. 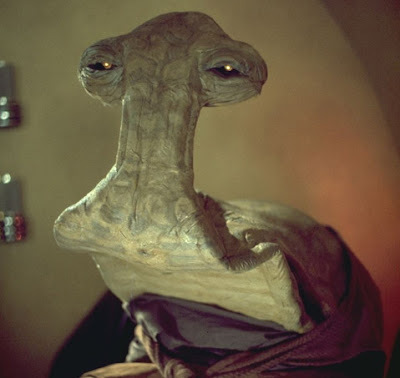 "Esoom smiled as only an Ithorian can, "That's right! It should be at 65%, but what are you so sad about?" "You did not ask me if I would be interested in your project" the little R2 said turning around and slowly putting the hose back in its holding area. "I did not know you were back here. Come out of there an into the hallway with me if you are interested. "The little R2 chirped out happily and raced out into the hallway ahead of Esoom almost tripping him in the process. The astro droid spun around in the hallway to face the Ithorian, retracted his middle leg and began rocking back and forth happily. Esoom took a minute to look the droid over, it was white with brown panels thatwere close to his own skin color, he had a little ware and a littlerust on his skirt area and the bottom of his feet but otherwise he looked like new. "Why are you and the other astromechs not tending to ships?" Esoom asked. "The other three did not get along well with the Ithorians; they were constantly talking back and causing trouble. No one wanted to use them so they put them in here till their minds could be wiped." The droid slowly chirped out, " I on the other hand was stored here to have my mind wiped for a different reason..."
"What would that be? It is ok to tell me" Esoom said as he gently placed a hand on the R2's dome. "I am an astromech who is afraid of flying. I never did like it, being strapped into a ship with my dome sticking out into the deep vastness of space." The droid bent slowly over to stare at the floor and continued, "I don't like to fix mechanical stuff anymore, I am good at it but after years of fixing the same stuff over and over I just would like a change. While I was in that store room I started to study the plants in there, all the years on this herd ship and I have never made it out of the maintenance bay to see a plant. I used the dataport there to learn everything about the plants in the room. That is why I knew about the plants moisture content." The Ithorian grinned down at the little droid and gently patted it on the head, " You are a very special astromech indeed, and it is by extreme luck or by the Force that we have met. I think you are thedroid I am looking for. Come follow me to one of the botanical domes, I have something to show you." The two of them walked quietly threw the ship, after a while they came to a clear set of doors and walked on threw. They entered a huge clear dome that was so big you could not see the other side. The little R2 unit was amazed, he turned his dome all around looking here and there trying to take it all in at once. Other Ithorians looked on, puzzled and worried at why an astro droid would be in here in the first place when there were other droids that are designed to work here. "These trees before you are the most sacred trees on Ithor, " Esoom said as he bowed to the forest in front of him; "they are called Bafforr Trees." Esoom went on to explain to the droid about the trees, the Ithorian belief in the deity of Mother Jungle, and all about the Law of Life. Some of what the brown skinned being told the droid did not make logical since but the morality and the goodness of the ideas made the droid happy. 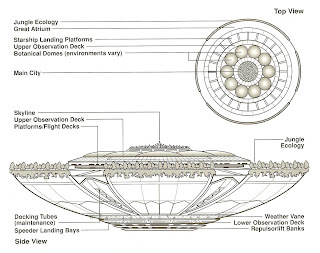 The two of them walked threw many other parts of the ship: the other Botanical domes that have many other environments and plants from other worlds, then the Upper observation deck was next where they looked out at the outer rim of the herd ship to see the Jungle Ecology After that they went to the lower observation deck and looked down on the planet Ithor. The little droid was a little uneasy as he looked down at the planet slowly moving under them. Then as they were heading back towards Esoom's living area the Ithorian explained more about his project and why he wanted to modify an astromech to do what other droids were already designed for, to be able to respond to many different types of threats that would bring harm to the plants in a small, compact, and fast design .He explained how just 23 full rotations of the planet ago one of his fellow co-workers accidentally tipped over some chemicals and started a fire. How the emergency fire suppression system did not go on and how none of the dome fire response droids would make it there in time let alone fit threw the door, the lab and the plants were a total loss. He continued on about how that was when he came up with the idea that if a small droid was around that could put out the fire or plug into the main computer and force the fire suppression to work the damage would have been at a minimum. When they finally exited a lift and got to Esoom's room he told the droid that he could stay here for the night and would let him think on his idea for the night then get back to him in the morning, He patted the droid softly on the dome one more time then walked off into another room. The little white and brown R2 unit rolled over to the only window in the sparsely furnished room and retracted his middle leg, he could not see threw the high ledged window so he swiveled his feet to stand on the very tips of them. From here he realized how far up he was in this tower on the outer edge of the main city and how big this herd ship really was that was stretched below him. He also realized how big of a responsibility Esoom was offering him and how lucky he was that Esoom found him and was giving him the opportunity to do something he would love to do. Hello everyone and welcome to my little piece of the Web.I would love to have an R2-D2 astromech droid but after seeing how many builders have one mine would just get lost in the crowd. My second pick was R2-A6, the green one from episode 1 but then it would have its own back story already made up for it. There were other colors that I liked but some were taken and some would not fit with my alter ego Star Wars character I have made up over the years. My alter ego character is one that I made up from scratch and will tell you more about him later. 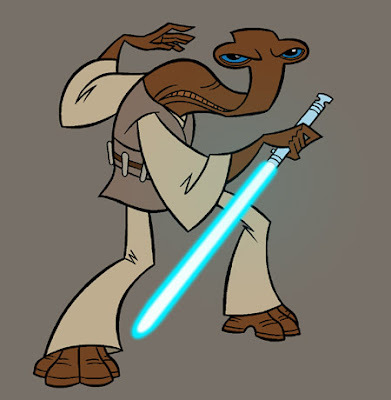 All you need to know right now is that he is a Ithorian living in the Clone wars era and his name is Esoom Mendo. (my real name backwards and split in half, try to figure that out. LOL)Anyway I thought "hey I have not seen an R2-D2 with Ithorian Brown panels before!" So I think I am going to go in that direction for now.I still need to come up with a serial number R2-....something.If I ever build a second astromech it will be the same Astromech but at a different time in his life when it is nicknamed "Patches".At some point R2-... gets destroyed and Esoom rebuilds him out of other junk R2 parts and ends up with all his panels being different colors.Look here for more updates in the future.Please do not steal or use my characters elsewhere. Thank You!